Why listen to your old factory speakers when an affordable upgrade is within reach? 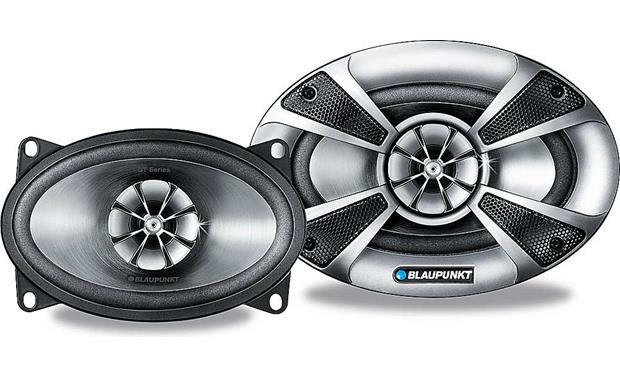 Blaupunkt combines modern design and high reliability to create the value-priced GT series speaker line. With new speakers, your music sounds great and car trips become a rare treat. The GTx462 4x6m speakers feature titanium-injected polypropylene woofers that deliver accurate, full-bodied sound. Mylar semi-dome tweeters reproduce the vocal and instrumental details smoothly and cleanly. Give your car's stereo system a new lease on life  Blaupunkt's GTx462 speakers bring back all the sounds that your old factory speakers miss. Grilles are included. It livened up my 1985 525e. Great sound with good highs and lows, high quality build, very easy to install. Injected Polypropylene Cones: The injected polypropylene cones are lightweight and mechanically rigid, allowing the speakers to play louder with less power. Acoustically inert, the cones do not "color" the sound of the music, giving you accurate musical reproduction. Each woofer uses a foam surround. 1" Mylar Tweeters: Each speaker features a 1" Mylar semi-dome tweeter for clean, accurate highs.